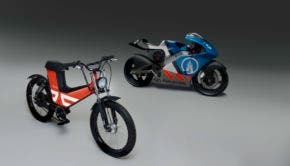 So far, the choice of electric two-wheelers for your last-mile commute has been fairly conventional. 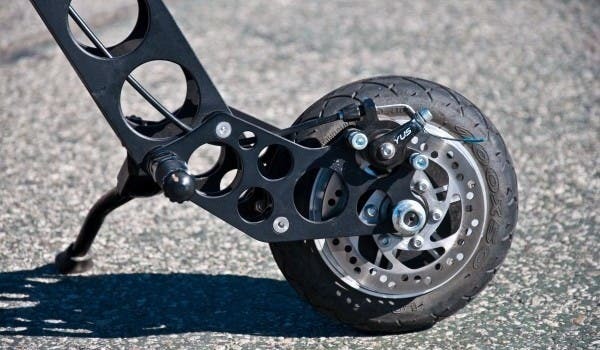 Two wheels with a base platform, a wheel on each side, a battery hanging below, an electric motor, and a seat. This configuration makes up pretty much everything available as far as e-bicycles and e-scooters. That’s why the first time I saw the Urb-E from Urban626, I had reservations. All these vanished two years later when I rode the Urb-E. 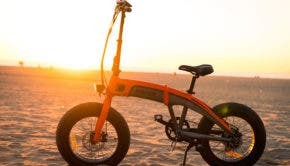 Although we have a choice of electric motorcycles or expensive e-bikes, this is where the Urb-E takes its stand and daringly rethinks what the electric last mile should be and feel like. It should be about performance, should fold up neatly, and should be fun to ride. I found all these points are well reflected with the Urb-E on my 9-day test ride. All of this is made in the US, right here in Pasadena and surrounding cities of southern California. When I first saw the Urb-E, I couldn’t help but wonder if it would be stable at all. It didn’t look like it would handle the first curve well with its battery sitting on that front fork. Those worries quickly disappeared as I followed Sven Etzelsberger, Chief Technology Officer and cofounder of the company, on a quick tour of downtown Pasadena. Within fewer than 3 minutes, I felt comfortable enough to zigzag between curious pedestrians gawking at this strange mobility device. Nine days after, I can vouch for the fun factor and how well balanced the Urb-E is. Although it will definitely lean into a corner, unlike a motorcycle or even a bicycle, the Urb-E attacks curves with enthusiasm, making for a very spirited and fun ride. It was just darn fun. The Urb-E excels with its versatility. I have never seen an electric scooter or e-bike that folds up and can be used as a grocery cart inside a store. How about fold up and climb aboard a bus, leaving those precious outside bike spots free? The Urb-E actually folds up neatly between your legs as you stand inside a public transportation bus. I even heard of a customer who rides his Urb-E to the boarding gate, hand checks it, and leaves the same way once at his final destination. I don’t know of any other electric mobility platform that is that versatile and fun to ride. The detachable battery makes it easy to remove it and recharge while you’re at a coffee shop, or work. You can also charge it directly inside the frame. All these points make for perfect conversation starters anywhere you go. It is so small and non-intrusive, you can fit 5 in the back of a Tesla Model S. Although this picture below only shows 3, you can see how 2 more could fit. Another two things that make the Urb-E stand apart are the reactions from pedestrians. I’ve never had as many smiles, thumbs up, and so many conversations as soon as people saw it. “What is it?,” “Where can I buy it?,” “How much is it?” But one thing words and videos can’t convey is the fun factor I’m insisting on. I’ve ridden a lot of two-wheelers, but none have been as much fun and left a permanent EV grin on my face as much as the Urb-E.
Its humble 250W front-wheel motor driven by a planary gearing system is up to the challenge, including hills. Its 36V detachable battery pack is enough to get you 20 miles at 15 MPH, almost anywhere. Its airless wheels won’t let you down and the disk-back brake will slow you fast enough. This Made in the USA little wonder really shows the quality of American entrepreneurship with a high-quality, aviation 6061 aluminum frame that has no sharp corners and nothing to scrap your skin on. The Urb-E comes in two flavors: the Original Edition and Black Label, respectively $1,499 and $1,699. In conclusion, the Urb-E is all about fun and compact versatility, which makes it a perfect urban mobility solution. If I could send you the fun factor everyone who’s ridden one has felt, I would, but the surest way is to go out and ride an Urb-E yourself. Full Disclosure: Nicolas Zart was not paid by Urb-E to write this piece — he just loves the thing — and CleanTechnica wasn’t paid either. 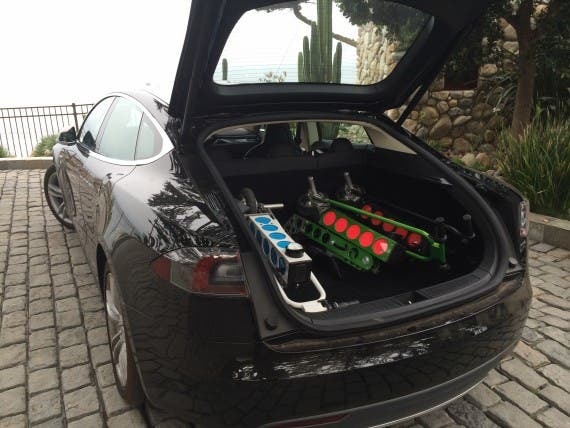 By the way, Nicolas is a Tesla Roadster owner, so he knows a thing or two about fun!